Heirloom Soapworks is a great local company to me. The carry natural and homemade soaps. 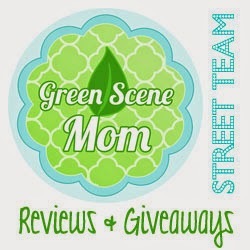 I have reviewed 2 of their soaps that they have in their store. First is their Unscented soap which is called their Coconut Milk soap Unscented. The one I got that day was in cupcake form and was so cute. Coconut palms and warm island breezes -perhaps we can't experience that everyday, but we can care for our skin the "island way": with pure coconut milk soap that's full of rich, tropical butters! 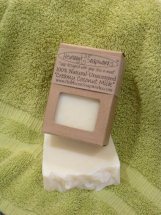 Coconut milk makes such a lovely, moisturizing soap, and I've designed this one specifically for sensitive skin. It's 100% fragrance free and made with skin-pampering vegetable oils and butters. No animal products in this variety either, so it's vegan-friendly. Enriched with skin-nourishing ingredients: coconut milk, mango butter & avocado butter, this 100% natural soap is spa-quality, and suitable for face and body. Each bar is approx. 4.5-5 oz. and is minimally packaged using recycled materials. Ingredients: saponified oils of olive, coconut & palm; filtered well water, coconut milk, mango butter & avocado butter. No Animal Testing - No Synthetics - No Parabens - No SLS - No Petroleum. That's right, it's ALL good! This is a great soap and I think it would make a great soap for all of you that make your own laundry detergent. 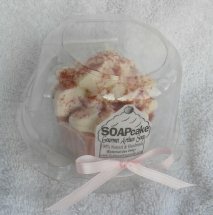 Next soap that I have reviewed is their Cupcake soap which retails for $5.99. All Natural Soap Cupcakes from Heirloom Soapworks can make bathing a bit more fun -for kids, and everyone in the family! You've probably seen soap "cupcakes" before, but 100% natural soap cupcakes can be hard to find. Each "cupcake" is approx. 4.5 oz. and comes packaged in a clear plastic clamshell with coordinating bow -ready for gift-giving. Ingredients: olive oil, coconut oil, palm oil, filtered well water, sodium hydroxide, shea butter, mango butter, cocoa butter & essential oils. Note: Almond Oatmeal-Orange variety also contains oatmeal, and Lavender-Mint & Jasmine-Sandalwood-Lavender varieties contain French pink clay. What a cute gift this would be a great item to get ahead of time for mothers day! I know my mom loves beautiful soaps that are all natural and great for the skin. They have other colors and smells in the cupcake as on their web site. 3 Lucky winners will win 1 bar of soap of their choice. I would love the try the rosemary lime one.